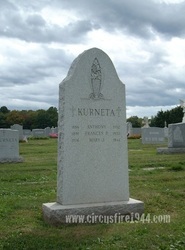 Miss Mary J. Kurneta of 101 Hotchkiss Street, Middletown, was born July 19, 1925 in Middletown, daughter of Polish born parents Frances (Platek) and Anthony Kurneta. Mary attended the circus with her mother, Mrs. Frances (Platek) Kurneta, her brother Stanley Kurneta, 26, her sister Elizabeth Kurneta, 9, and her nephews Anthony Kurneta, 4, and Raymond Erickson, Jr., 6. The group sat in reserved section 'S' to the left of the main entrance, four rows from the top, and across from the center ring. When her brother Stanley noticed the fire to the right of the main entrance, they hurried toward the main entrance. Stanley pushed Frances and Elizabeth over the animal chute, but lost Mary and Raymond in the crowd. Stanley later found Raymond, seriously burned and in wet clothing, and rode with the boy in an Army truck to Municipal Hospital where he is presumed to have died although his body was never found. Mary was found dead at the circus grounds and was buried at Calvary Cemetery in Middletown after services at the Ahern Funeral Home. Her body of was identified at the State Armory on July 7 by her brother-in-law. Miss Kurneta leaves her parents; her brothers Stanley, Joseph, 23, Charles, 21, and Frank Kurneta, 16; and her sisters Mrs. Sophie Erickson, 29, Mrs. Tessie Bucionis, 25, and Elizabeth Kurneta. Mary was employed as an assembler at Cuno Engineering Co. in Meriden at the time of her death. Her estate was awarded $9,500 by the arbitration board.